We hope you all had a great weekend! 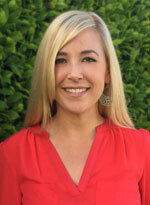 Today we would like to introduce you to Kelly Stump, our Program Support Coordinator – Special Projects! Kelly joined the Project Tomorrow team as a Program Support Coordinator in 2015. In addition to supporting education research and other projects, she also coordinates several events such as the annual Innovation in Education Awards and the Youth Leadership Summit. Kelly has always had a passion for education. After receiving a Bachelor of Arts degree in Communication from the University of Southern California, she spent six years teaching an environmental science program with the Orange County Department of Education. At Project Tomorrow, Kelly hopes to continue to support and encourage students to pursue their passions through education. In her free time, she enjoys spending time with her friends and family, hiking, and reading. This entry was posted in Uncategorised and tagged Kelly Stump, Project Tomorrow, Project Tomorrow Team on March 30, 2015 by Lisa Chu.